The crisp blue scene weighs heavy with a land painted white with fresh snow as a tawny owl sets off on an adventure, removed from its master and entrusted with carrying a scroll of parchment tucked in its claws as it takes to the sky with spread wings and a readied mind. The young lass glances back, full of hope that her owl’s journey is of success and the contents of her scroll are delivered in received in confidentiality just as it was sent in secrecy. 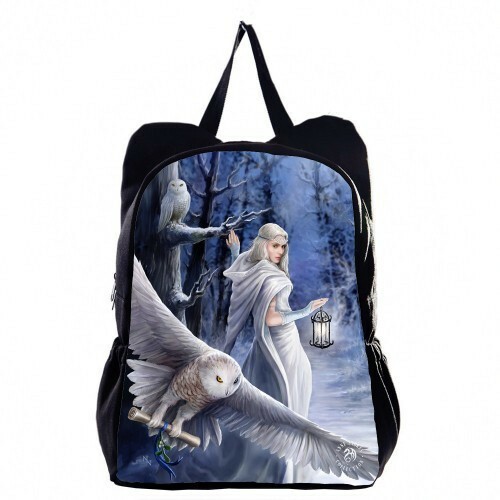 This bookbag has a chilling and hopeful presence to it as we do not know if the owl’s return nor its success just as we all pursue life blindly with no insight on the outcome. To own this bag truly shows the mask of life and taking this Owl backpack home is just as wondrous as creating a story for the owl’s successes. This Owl backpack holds many secrets in itself just as you can when holding all your essentials.